Coming on the heels of Ebrahim Sharif’s re-arrest this Sunday, prominent human rights defender Nabeel Rajab was pardoned yesterday and released from prison due to “health reasons,” after serving four months of his six month sentence. While Americans for Democracy & Human Rights in Bahrain (ADHRB) the Bahrain Institute for Rights and Democracy (BIRD) and the European Centre for Democracy and Human Rights (ECDHR) cautiously welcome the decision to pardon Nabeel Rajab, we reiterate our concern that his conviction stood in relation to acts of free expression. We are additionally concerned that the Bahraini government maintains further charges against him relating to his peaceful activism that may result in up to fifteen years in prison. Rajab’s release follows increased international pressure on Bahrain to release political prisoners, including Rajab in particular. Just last week, the European Parliament passed an urgency resolution calling for the immediate release of Rajab and other prisoners of conscience. In June, the UN Office of the High Commissioner for Human Rights (OHCHR) raised its concern regarding Rajab’s arrest in relation to his tweets. Further, in his opening remarks to the 29th Session of the Human Rights Council, the UN High Commissioner for Human Rights personally called for the release of all those detained in connection with peaceful activities in Bahrain. Additionally, the US State Department urged the Government of Bahrain to drop all charges against Nabeel Rajab earlier this spring, following Congressman Jim McGovern’s (D-MA) statement that called for Rajab’s immediate and unconditional release. Last month, the US reiterated its concern regarding Rajab’s detention at the Human Rights Council. Such public pressure has compelled the Government of Bahrain to act. 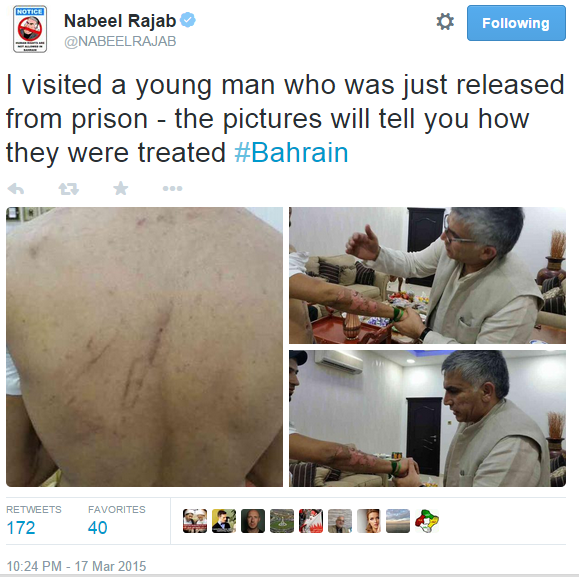 Following the release of Nabeel Rajab due to his “health concerns,” we invite the Government of Bahrain to further review the cases of hundreds of other arbitrarily detained prisoners struggling with health concerns. Dr. Abduljalil al-Singace, who struggles with partial paralysis associated with post-polio syndrome, sickle-cell anemia, and sinus, eye, and heart problems, recently completed his 100th day on hunger strike in protest of the conditions in Jau Prison. Naji Fateel and Abbas al-Samea continue to suffer from injuries sustained during violent government suppression of the Jau prison riots in March of this year. Tagi al-Maidan, an American-Bahraini prisoner, suffers from ulcers and scoliosis, amongst other injuries. These prisoners continue to be denied adequate access to health care and remain in urgent need of medical care.